1 The mystery of the Bermuda Triangle dates back to the first voyage of Christopher Columbus. 2 The name "Bermuda Triangle" is not even recognized! 3 No formal study has been undertaken to investigate the Bermuda Triangle! 4 The Bermuda Triangle is not even a triangle! 5 Magnetic north and true north are location specific, Bermuda Triangle is no exception! 6 Rivers within the ocean can cause aircraft to have a difficult time landing. 7 Destructive hurricanes at sea can sink even the mightiest ships. 8 Mud volcanoes can quickly sink a large ship. Mysterious circumstances have caused dozens of ships and planes to disappear in the Bermuda Triangle. This has earned it the nickname, “The Devil’s Triangle” as well as making it one of the most popular unsolved mysteries of our time. There are both scientific reasons and myths for these disappearances; however, because all of the stories have some truth, it is very difficult to separate the two. Stories of the Bermuda Triangle have been so embellished that it is up to you to decipher the Bermuda Triangle facts from the myths. The mystery of the Bermuda Triangle dates back to the first voyage of Christopher Columbus. There is a story that Christopher Columbus' log records indicate that they saw a large ball of fire fall to the sea. It states that the ship's compass went chaotic at that point. Although it is said that this story happened in the Bermuda Triangle, it actually happened at the Canary Islands right before the ship set sail. The name "Bermuda Triangle" is not even recognized! One of the most mysterious places on Earth, The Bermuda Triangle is not even located on any map or in any database! The US Navy does not have any record of it, nor does the US Board of Geographic names recognize it. 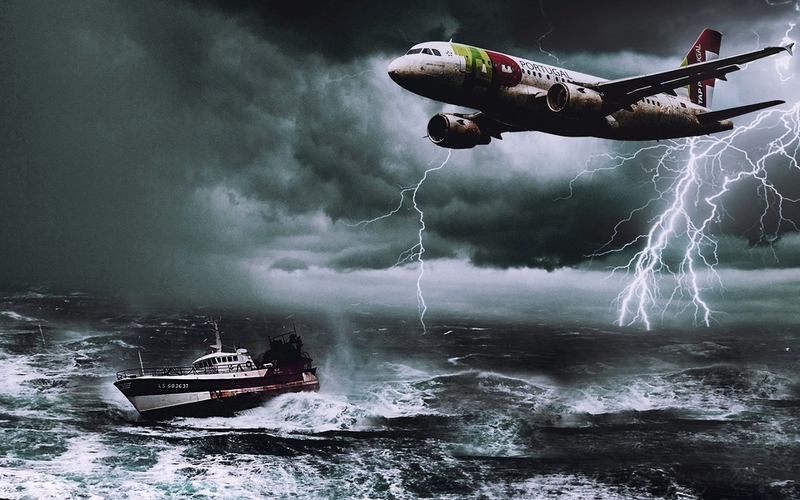 People around the world have attributed unexplained disappearances to the Bermuda Triangle, but documentation has claimed that the incidents were inaccurately reported, or exaggerated by later authors. The Bermuda Triangle is not even listed in the 10 most dangerous shipping waters created by the World Wide Fund for Nature. No formal study has been undertaken to investigate the Bermuda Triangle! Only private investigations have been done to uncover the disappearances within the triangle. Since there has not been a formal study, it is imperative that you weigh the evidence against the reliability of the source. There are many theories and ideas about alleged disappearances such as methane gas knocking captains unconscious, the magnetic pull of the Bermuda Triangle, or 80 foot waves of destruction. However, none of these theories have been scientifically proven. The Bermuda Triangle is not even a triangle! The Bermuda Triangle is not on any map because it does not have any actual location, therefore the shape of the actual area remains uncertain. The idea that it is shaped like a triangle is based on the fact that many believe it to be the area between Miami, San Juan, and Bermuda which makes somewhat of a triangle. The actual shape remains as vague as its location because it is an imaginary location founded on lore. Magnetic north and true north are location specific, Bermuda Triangle is no exception! Many people have claimed that compass problems have been the cause of many incidents within the Bermuda Triangle. Scientists have not found any magnetic anomalies that will cause a compass to go haywire in the suggested area. Another bit of confusion comes from the fact that compasses have natural magnetic variations related to the magnetic poles in the Earth dependent on one's location. Only in a few places are the magnetic north and true north exactly the same. Ship navigators have known this for centuries, but the general public has been ill-informed. Rivers within the ocean can cause aircraft to have a difficult time landing. The Gulf Stream is one of these rivers. It is a current on the surface of the Atlantic Ocean that is directed by the reaction the surface water has to the change of temperature. This particular current flows from the Gulf of Mexico through the Straits of Florida and into the North Atlantic. This can definitely cause a small plane to be carried away as it has a speed of approximately 5.6 miles per hour. Destructive hurricanes at sea can sink even the mightiest ships. Extremely powerful storms known as tropical cyclones are regular occurrences in the Atlantic Ocean. They have been the cause of thousands of lives being lost and billions of dollars in damages. Several of the incidents that are said to have been caused by the Bermuda Triangle have actually been caused by these powerful storms. A downdraft of cold air hitting the warm North Atlantic Ocean can cause severe power that causes a bomb like explosion in the water. Mud volcanoes can quickly sink a large ship. The myth of methane gases that cause the crew to fall unconscious may lie in the methane hydrates that exist across the bottom of the ocean on continental shelves. The results of experiments done in Australian labs have proven that enough bubbles can be created to affect the buoyancy of a ship, causing it to quickly sink. The methane hydrates are commonly called mud volcanoes and spew natural gas.